Inventicamarine has announced the appointment of Eurotask Ltd as the US Distributor for YachtSpot, their range of professional, marine grade WiFi, 4G and Satellite Router products. Inventica have been successfully marketing YachtSpot in Europe for over 10 years. Designed with both the end user and the professional installer in mind, it is the preferred choice of many of the world's top yards, integrators and installers. The YachtSpot WiFi, a WiFi only solution for connection to the Internet via available Marina Hotspots, this unit uses a powerful carrier class 802.11 b/g card which works on 2.4 GHz. 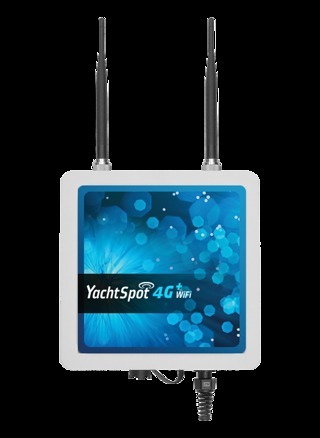 The YachtSpot 4G+WiFi G2 is a reliable wireless Internet solution for use in the marina or near shore, with options providing worldwide coverage of 4G and 3G frequencies and WiFi connectivity in one feature rich device. Our NEW YachtSpot PRO model goes one step further allowing the integration of other marine Internet routers such as V-SAT, or Fleet Broadband, enabling end users to easily switch between a variety of Internet connection technologies. The simple user interface makes it great for the owner and the crew too and for the installer we've included just about every option you will ever need and then hidden away the administration pages which are not required. To improve performance, particularly in areas where there are slow or "lossy" networks, YachtSpot's DNS Blaster™ technology is used to query several DNS servers simultaneously resulting in much faster browsing and an almost guaranteed reply to DNS lookups. DNS Blaster™ works with both Mobile and WiFi technologies. Where security is paramount, YachtSpot offers an add-on, SafeSurf VPN™, encrypting your WiFi Internet traffic to our secure VPN servers. SafeSurf VPN™ is subject to an annual subscription. "Inventicamarine have recently invested in gaining FCC approvals on the complete YachtSpot range and with the added bonus of a beneficial exchange rate there has never been a better time to introduce this well tried and tested range of Professional Products into the US market." explained Mark Luffingham, the principal at Eurotask. "YachtSpot has a very loyal following in Europe and I believe we can achieve similar success in the US by adopting the same philosophy of providing a reliable, easy to use product that is well supported and upgradeable, thus extending the life of the product. When your boat's network logs on with YachtSpot, it stays on."